In this undated photo released on Monday, Feb. 16, 2009 by the French Defense Ministry, the French Le Triomphant submarine is seen at sea. LONDON — Nuclear-armed submarines from Britain and France collided in the Atlantic Ocean earlier this month, authorities acknowledged Monday — touching off new concerns about the safety of the world's deep sea missile fleets. Britain's most senior sailor, First Sea Lord, Adm. Jonathon Band, said the underwater crash posed no risk to the safety of the submarines' nuclear reactors and nuclear missiles. But he offered no explanation of how the rare incident might have occurred. "The two submarines came into contact at very low speed," Band said in a statement. "Both submarines remained safe." France's defense ministry said the ballistic missile submarines had been carrying out routine patrols when they collided. "They briefly came into contact at a very low speed while submerged. There were no injuries. Neither their nuclear deterrence missions nor their safety were affected," France's defense ministry said Monday in a statement. 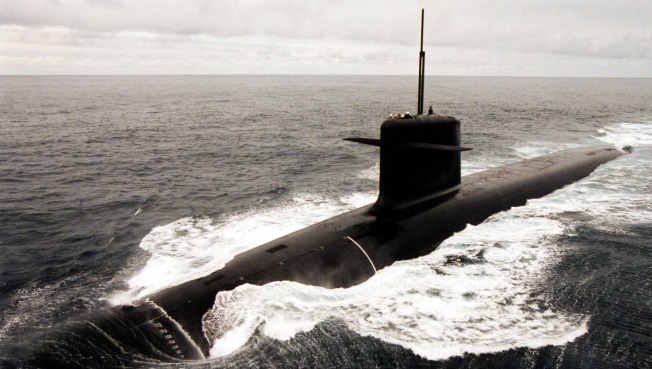 The Le Triomphant suffered damaged to a sonar dome in the front of the submarine but returned under its own power to its base on L'Ile Longue on France's western tip, according to the French military. Neither France nor Britain would confirm the exact date of the collision, but said it took place earlier this month. France issued a brief statement Feb. 6 saying the Le Triomphant had struck "a submerged object" that was probably a shipping container. Naval experts were amazed by the collision. "This really shouldn't have happened at all," said Stephen Saunders, a retired British Royal Navy commodore and the editor of Jane's Fighting Ships. "It's a very serious incident, and I find it quite extraordinary." He said while NATO countries let each other know what general area of the Atlantic they are operating in, neither submarine would have had a precise position for the other. Saunders said submarines don't always turn on their radar systems or make their presence obvious to other shipping. "The whole point is to go and hide in a big chunk of ocean and not be found. They tend to go around very slowly and not make much noise," he said. Lawmakers and disarmament advocates demanded an explanation of how the submarines could have failed to detect each other. Britain's government "needs to explain how it is possible for a submarine carrying weapons of mass destruction to collide with another submarine carrying weapons of mass destruction in the middle of the world's second-largest ocean," lawmaker Angus Robertson of the opposition Scottish National Party said. Stephane Lhomme, a spokesman for the French anti-nuclear group Sortir du Nucleaire, said its activists were on alert for any signs of radioactive leaks near French shores. Britain's Campaign for Nuclear Disarmament called on Prime Minister Gordon Brown to end his country's nuclear submarine patrols of the Atlantic. "This is a nuclear nightmare of the highest order," said Kate Hudson, the group's chair. "The collision of two submarines, both with nuclear reactors and nuclear weapons onboard, could have released vast amounts of radiation and scattered scores of nuclear warheads across the seabed."